Last night my family and I celebrated Yule! (For those that don’t know, Yule is the celebration of the official start of the Winter season). We had a great dinner, conversation, and opened presents. My daughter got a pretty awesome hot pink guitar, as well as her first easy bake oven (following in her mama’s footsteps ha!). But she wasn’t the only one that got an awesome present. I got to tear in to a beautifully wrapped package with a KitchenAid Slicer/Shredder Attachment inside! I have been eyeing this beauty since I received my mixer last year and I was stoked to check it out! 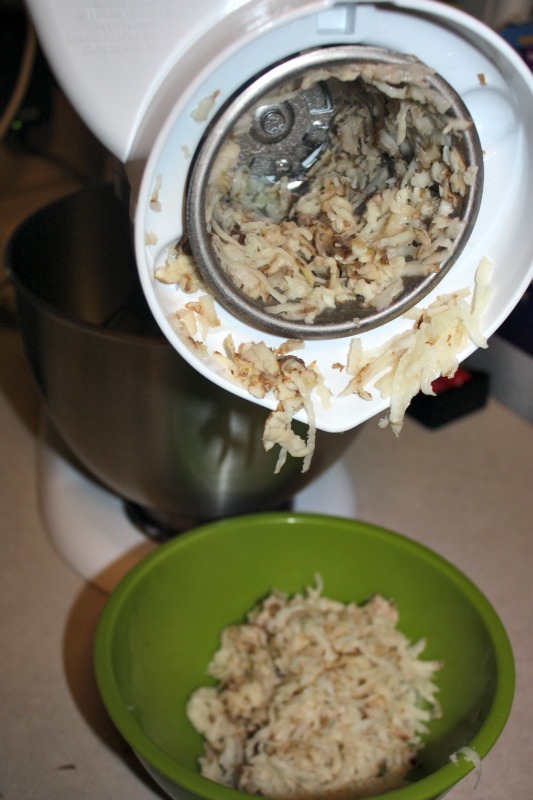 So what did I think of the KitchenAid Slicer/Shredder Attachment? Upon checking out the box I was thrilled to learn that the KitchenAid Slicer/Shredder Attachment works on cheese, fruits, and veggies! No more crying when trying to slice onions! No more uneven slices of apples, or spending half an hour trying to shred a block of cheese. I knew this was going to make my life in the kitchen so much more enjoyable! 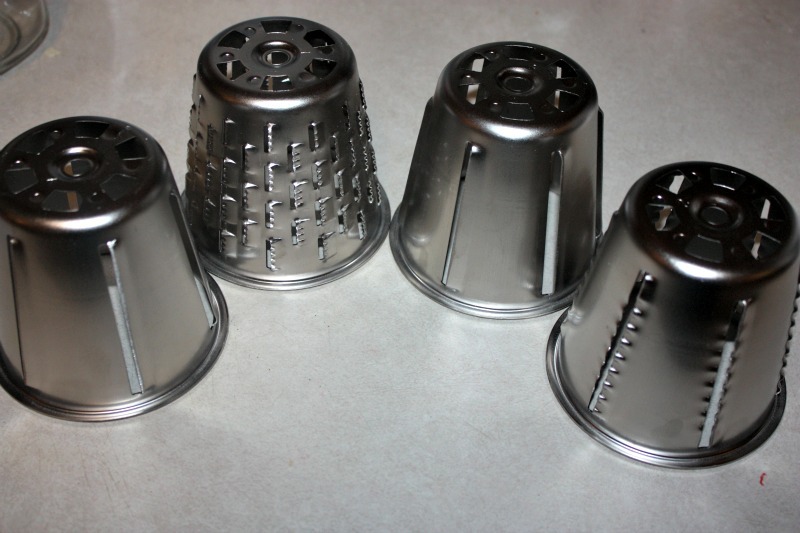 The KitchenAid Slicer/Shredder Attachment comes with 4 different cones. 2 shredding cones (fine and coarse) and 2 slicing cones (thin and thick). They are well made, and because they are made of stainless steel, they are easy to clean. My daughter requested hashbrowns for breakfast this morning, and I was happy to make them for her! I simply washed my potatoes, set up my KitchenAid Slicer/Shredder Attachment and got to work! 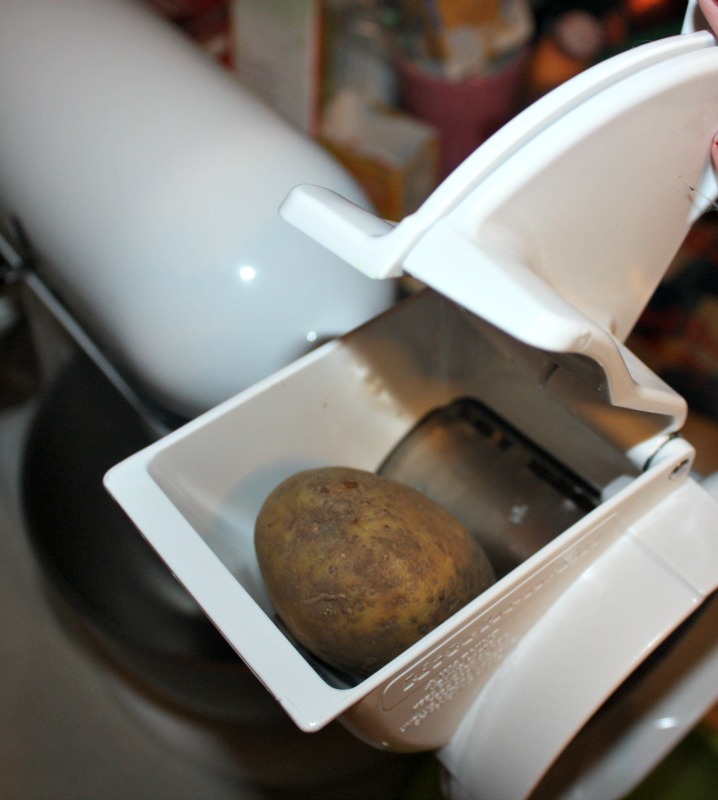 Using the KitchenAid Slicer/Shredder Attachment really is as easy as placing the potato in, and pressing down the lever. The KitchenAid Slicer/Shredder Attachment does all the hard work for you! 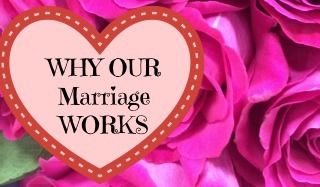 I couldn’t believe how easy it was to use! It took me about 5 minutes to shred 8 potatoes! In conclusion, I am SUPER pleased with my KitchenAid Slicer/Shredder Attachment and know that I will be using this often in all types of recipes! I woul totally use that all the time! I need to get this attachment! This is something I need! I hate to try to shred things by hand. I always slice or shred one of my fingers! This would make so many of my recipes easier. We make home-cooked meals almost every night so this would be great for us. I do not know how we would function without our KitchenAid mixer. We use it so often and own a few additional attachments too. Looks like this is another I need to add to my list. I would love a kitchen aid. All of the attachments are calling my name. HappyYule. Kitchen Aid makes a lot of great products. 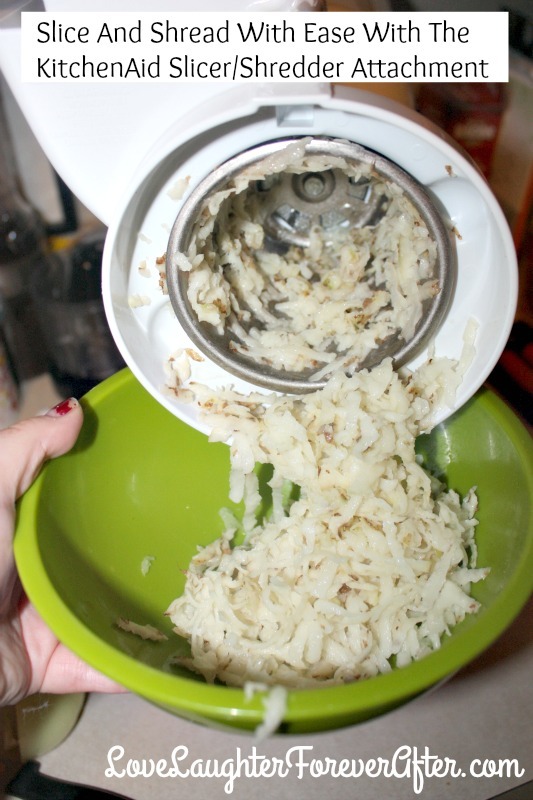 I make a lot of homemade hashbrowns so this would be the perfect attachment for me. I will have to put this on my wish list. This is awesome! I don’t have a mixer but think this is great! Shredding by hand is the worst. This is a great product! Donna recently posted..Forget Cookies – Santa Wants Bacon!! I would love to have this attachment for my mixer. I would honestly love to have all of them! I have always wanted a Kitchen Aid Blender but I didnt know attachments came with it! Thanks for telling me hopefully I will get a mixer for Christmas! I love my kitchen aid mixer! I have been wanting to buy the attachment but wasn’t sure if they were worth the money. Looks like they are! My hubby would have loved this slicer shredder attachment from Kitchen Aid for Christmas, maybe next year. I didn’t realize it had four different cones! OMGoodness, I was craving hashbrowns with onions this morning. Love these features to make everything in the kitchen simpler! WOW, how easy was that? I have the most difficult time shredding by hand. Such an easy solution! I would love to find a KitchenAid Slicer Shredder under my tree. It would make preparing meals so much easier. Oooh, I need this attachment! I got my mixer last Christmas, now I need this! Every woman I know who doesn’t already have one, wants one of these bad boys. 🙂 I’d like one myself. Wow! Mind blown at how easy that is! 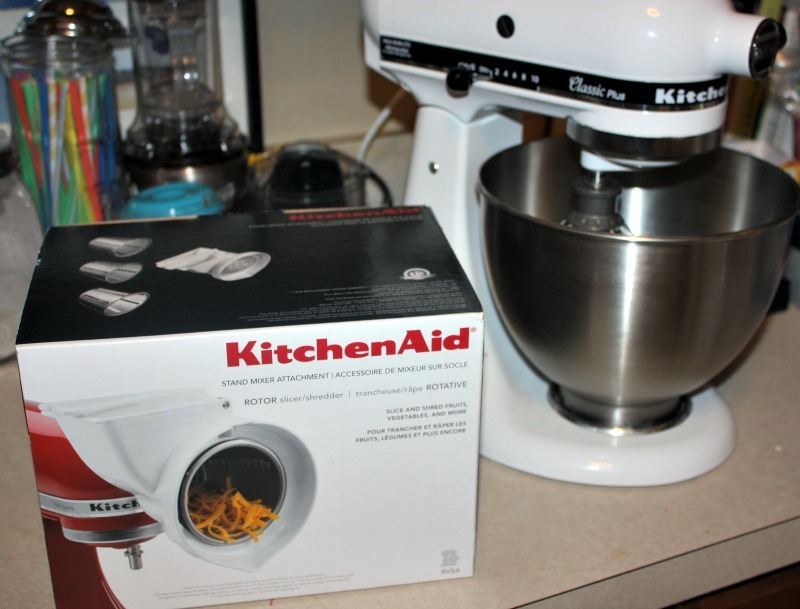 I am hoping Santa is giving me a KitchenAid, so this would be a great attachment for me. Kelly Hutchinson recently posted..Inspirational Gifts For Christians From H.O.P.E. We have a Kitchen Aid mixer and I’ve often wondered about the attachments. I think they have a pasta cutter and ice cream attachment too. Thanks for the word on this shredding attachment. That’s such a great tool. I know it’d save me a ton of time in the kitchen, prepping for meals.